Allen Fannin used to remind people that what weavers do is make someone else's 'raw' materials. As weavers we are just another stepping stone in the production chain of getting raw fibre into something useful. If you are hand weaving, you are automatically making 'slow' cloth. The biggest investment in hand woven cloth is the labour that goes into getting it from the animal's back, or the plant, processed into yarn, then from yarn into cloth, then from cloth into...whatever it is meant to be. I remind myself of this by saying "it's just string". Especially when I - who am not yet and never will be, perfect - have another oopsie. Like I did yesterday. The clock is ticking down on getting the book projects done, so yesterday I decided that my first priority was to deal with the next one. One of my favourite weave structures - Bronson Lace - was ready to go. I'd wound the warp on Friday and beamed it - all that was left was to thread the (narrow/short) warp, sley, tie on and start weaving. Piece of cake. Right? The yarn I'm using is a new-to-me 2/10 unmercerized cotton from Ashford. I'm using a borrowed loom which has a square rod to tie onto. The yarn, which is slipperier than Brassard's unmercerized cotton didn't want to hold its knots on the square bar. Decided to cut off and lash on. I was very tired from not having slept much the night before and - without checking the warp beam to see where the warp packing was - because on my Leclerc the warp packing pretty much unloads without my having to check on it - the borrowed loom has a different configuration and the warp packing tends to pile up for a while before coming far enough over the warp beam to drop by itself - anyhoo - I grabbed the scissors and snip-snip-snip and the warp slithered out of the reed and heddles to dangle from the warp beam. Sans cross. 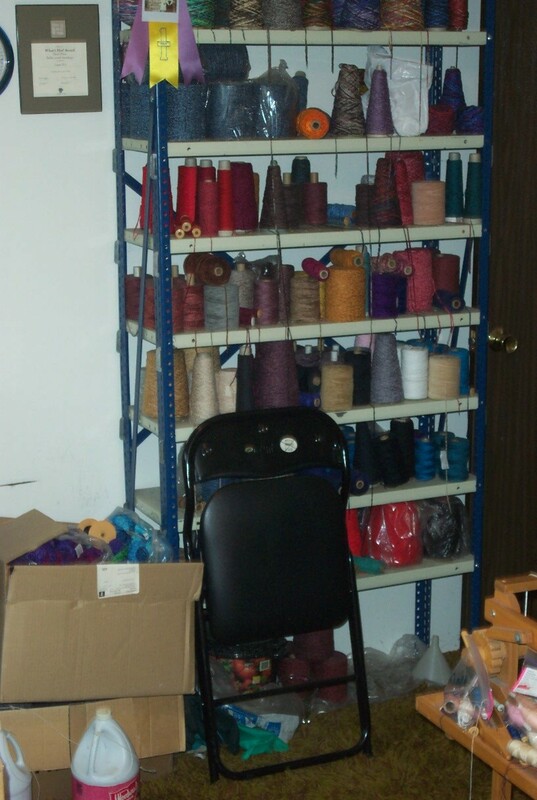 At that point I took a break, had a snack, then removed the $5 worth of warp from the loom and tossed it into the recycle bin. I could have 'saved' it. But the aggravation level of dealing with a warp that no longer had a cross outweighed the cost of the yarn. There is plenty more - the warp weighed about 80 grams. There was lots left on the cones. Another warp was wound and rough sleyed. I came to weaving with an awareness that life is uncertain, that time - whatever time we may have - is precious and not to be 'wasted'. I'm also not a patient person. Even though I am very efficient when it comes to weaving, there are still things that I'd rather not do. And spending an hour to salvage $5 worth of yarn is not one of them. Even though it will take an hour to wind a new warp and get it beamed, I'd rather spend my hour starting anew than fussing with saving a warp that just isn't - in my life/studio - worth it. At long time ago I came to the conclusion that I can always make more money to buy more 'string'. Once the coin of my time has been spent? There is no getting more, by hook or by crook. But each of us has to decide - do I spend my time doing this? Or that? I always loved looking at historic textiles and determining their age. The age of the garment and the age of the fabric are two entirely different things. When one bought cloth to bring to a tailor, the cloth was the most expensibe part of the garment and was remade several times. Not only by the "poor", but seen even more in expensive silks and high fasion fabrics. Special care was taken and additional seams added to use as much of the fabric as possible. The labour that goes into the creation of fabric was highly valued in antiquity. I'm slowly trying to remind myself that my labour is more important than $5 worth of string. Somedays it's hard! If you create slow fabric, then I'm even farther down the chain - washing, combing and spinning your raw material (or mine, but you get the analogy). And you know what? I don't care. I love the process so much, that that is the reward and the entire point. Time is important as our allotted amount for this lifetime ticks away. We're each of us refining how we chose to use it. Good on you for find your way! I love your summary at the end of this post. Yes, it may take the same amount of time to wind a new warp as to save the 'failed' one, but if we don't choose how we spend our all-too-limited time here, then what are we saying/doing/thinking about our lives? Let us make the choices. It is, after all, just string.